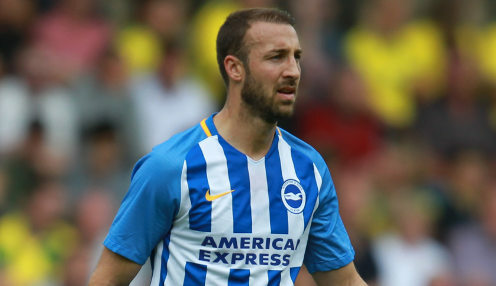 Chris Hughton is relieved that veteran striker Glenn Murray escaped serious injury during Brighton's 1-0 victory at Newcastle United on Saturday. However, Murray looks set to miss the Seagulls' next top-flight match against Wolves, which they are 3.50 to win, after he was involved in a clash of heads in the first half of the St James' Park encounter. Murray was initially left unconscious after an accidental collision with Magpies defender Federico Fernandez and did not travel back to Brighton with the rest of the squad after the match. Hughton said: "Glenn is from up here, so he was always planning on staying up. We'll do what's appropriate this week. There are certainly rules and regulations as regards anybody having concussion. We'll certainly abide by them. "He's okay. He's been discharged from hospital. He is sore. He was (knocked) out. He's had everything he's needed to have, the correct scans, and everything is fine. "It will just be a question now of recovery. He'll obviously be sore for a while." There were fears that Murray had swallowed his tongue, with Hughton adding: "Yes, there was fear, only because of when you see players' reactions. From where we are we had no idea. We knew what had happened and there had been a collision but we had no other detail. "When you see the players as stressed as they were it makes you more concerned." The result leaves Newcastle at the foot of the table and Rafa Benitez's side can be backed at 4501.00 to be relegated this term.